Home » entertainment » Is Olakunle Churchill Gay? Tonto Dikeh Says "Don't You Have More Men To Sleep?" Is Olakunle Churchill Gay? Tonto Dikeh Says "Don't You Have More Men To Sleep?" Anyone knows what triggered Tonto Dikeh lately? 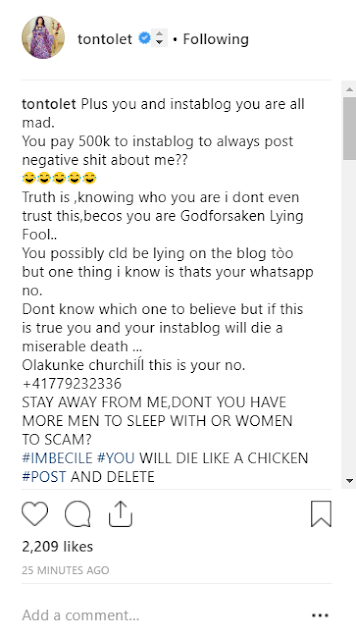 The actress who has been slamming her ex-husband Churchill, has now shared a Whatsapp conversation he had with someone in 2017, saying he paid N500k to Instablog9ja for posts. "Plus you and instablog you are all mad. You pay 500k to instablog to always post negative poo about me? ?